The following graphics are courtesy of a select few who wished to donate them to OJC. If you have or are thinking of adopting a POW/MIA please help yourself to the following graphics with our thanks. These also may be used if you have a Military related or patriotic website. NOTE: These graphics are COPYRIGHTED by their authors and MAY NOT be used in anyone's archives nor may they be published or used in any commercial endeavor without the permission of the author. Do NOT link to the graphics on this site. Download them to your own computer and upload them to your own server. Lastly, for more graphics please visit the listed sites. Only POW/MIA graphics will be found on this site to help assist with the creation of POW/MIA pages. There are many more graphics and/or backgrounds at the sites listed below. Also don't forget your net etiquette, be sure to give a credit and a thank you on your site for the use of the backgrounds and graphics. A link to the author's site(s) is appropriate. Click on the Author's name for graphics here at OJC. Bracelet Graphics: NEW! Another free service offered by Operation Just Cause and our dedicated staff! Order your virtual bracelet FREE! New graphics March 1, 1999! It is shown to scale at 512 * 50. It does NOT have a border but is shown with one so the edge will appear. You are welcome to use this graphic on your page(s). 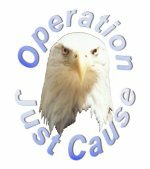 Use of the background without the "Member" text is reserved for use at Operation Just Cause. There is also a button available for use without the "Member" text for use as a link back to OJC. Again, there is no actual border. Have a graphic to contribute? Please send it to the Graphics Coordinator for consideration to be added to this site. Please remember that size is important. As ling as clarity is maintained, smaller is better. Thanks to Debby, Dennis, Doc, Hollie, Joni, Karen, Nomad Queen, Ron Fleischer, Slane, Windy, Wishmaker, and all those who have contributed, for allowing us to post their wonderful graphics on this site. Don't forget to visit these sites for many more patriotic graphics and backgrounds.